Have you noticed that in the last few years you seldom hear about airliners crashing? Yes, it happens every now and then, but it used to be that there would be a couple of big ones every year. Overall, it was still quite safe, but the big accidents made a big impression with heaps of people. But today accidents are increasingly rare, especially considering the even bigger numbers of commercial aircraft that are flying. Why is this? One reason is something called Cockpit (or Crew) Resource Management or CRM. Cockpit Resource Management is something airlines use to eliminate human error and improve safety. There are strict guidelines about what goes on in a cockpit. So, for instance, there are certain critical times where the conversation can only be about what is going on with the flight. There is accountability between crew members. There are extensive checklists that need to be strictly followed. Cockpit Resource Management is a key reason why travelling by airline today is absolutely the safest way to travel. In fact, the medical community is adopting much of the same philosophy and the same procedures for operating rooms. It’s expected this will save lives in hospitals too. I think we can all agree: in aviation and in medicine, if you just let people do their own thing, the results can be disastrous. Even the world recognizes the value of strict discipline in certain contexts, like in the cockpit or the operating room. Even the world sees the necessity of discipline to save lives. Likewise the church needs to see the necessity of discipline for eternal salvation. Letting people go their own way and do their own thing might avoid confrontation and might be the comfortable thing to do, but it is not a loving thing to do. No, a loving church will always practice discipline in conformity with the Word of God. After all, this is what our loving Saviour taught us to do in Matthew 18:15-20. If we love him – and if we love one another – we’ll want to follow his wise way. This is the second in a series on famous quotes from church history. We’re looking at who said these famous words, in what context, and whether it’s biblical. We believe since this holy assembly and congregation is the assembly of the redeemed and there is no salvation outside of it, that no one ought to withdraw from it, content to be by himself, no matter what his status or standing may be. We’re especially focussing on those words in italics: “there is no salvation outside of it.” These words (or words similar) are not unique to the Belgic Confession. You’ll find this notion expressed in other Reformed confessions like the Second Helvetic of 1566 (ch.17) and the Scottish Confession of 1560 (ch.16). The idea is also expressed by John Calvin in Institutes 4.1.4, “Furthermore, away from her [the church’s] bosom one cannot hope for any forgiveness of sins or any salvation…” However, none of these are the original source for the saying. In fact, the saying dates back to the early church. Especially in scholarship the saying is often referred to in its Latin form: extra ecclesiam nulla salus [outside the church no salvation]. It’s often attributed to the church father Cyprian (200-258). Certainly Cyprian uses the expression in his book On the Unity of the Catholic Church. However, the original source is slightly earlier. Origen (185-254) used these words in a sermon on Joshua 2. Rahab and her family had to remain within their house if they were going to be saved during Jericho’s destruction. Origen explains this as a reference to the church: “Outside this house — which means outside the church — there is no salvation.” Not only Cyprian adopted this expression, but also Augustine. From the church fathers, it was also taken up into the Reformation’s teaching about the church. But is this a biblical teaching? It must be said: the extra ecclesiam quote has sometimes been understood in an unbiblical way. It has been used by the Roman Catholic Church to claim that salvation depends on membership in their organization. It has been understood by some Reformed people to mean that salvation does not exist outside of their own particular church or federation of churches. In other words, if you are not a member of this church, then you are definitely lost. That makes salvation conditional on the right church membership. That goes not only beyond what the Scriptures teach, but against. The Bible teaches salvation in Christ alone (John 14:6, Acts 10:43, 1 Tim.2:5). However, there is a biblical way to understand these words. These words, as used by the Belgic Confession and other Reformed confessions, should be understood in a normative sense. The norm is that Christians experience salvation through the ministry of the church of Jesus Christ — especially through the preaching of the good news. That is how God has ordained salvation to proceed. Because that’s the norm, no one should ever forsake or ignore the church. Her ministry is not superfluous, but necessary. Article 28 of the Belgic Confession appeals to Matthew 16:18-19 as a proof-text here. Christ entrusts the keys of the kingdom to Peter as the representative apostle. The keys of the kingdom are given to the church through the apostles. Binding and loosening happen through these keys: the preaching of the gospel and the administration of church discipline. Salvation is realized through the ministry of the church, not ordinarily outside of it. This ancient saying is included in our confessional heritage to remind us that the church is not optional. While our salvation is not based on our church membership, our salvation is ordinarily mediated to us through the church’s ministry. The church and its ministry of Word and sacrament is where God has promised to be present to bless his people with life and growth in Christ. If that’s where he has promised to be present, why would you want to be anywhere else? Women in Office = False Church? It could happen later this year that the Reformed Churches in the Netherlands decide at their synod to officially allow women in office. I pray that it doesn’t, but the possibility is definitely there. That raises questions relating to article 29 of the Belgic Confession. Specifically, if a church federation were to adopt women in office does that automatically mean that they have become a false church? That question needs to be answered carefully. This isn’t the first time we’ve encountered the idea of women in office in Reformed churches. Back in the 1990s, the Christian Reformed Church in North America first discussed it, and then gradually adopted it. That adoption was one of the biggest catalysts leading to the mass exodus from the CRC between 1992 and 1994 — over 17,000 members left just in those years. A good number of those ended up forming what would later become known as the United Reformed Churches. I remember some of the early talks between the CanRC and URCs in the Bulkley Valley in north-central British Columbia. This would have been in the early 2000s. Questions were asked of our URC brothers such as: do you now view the CRC as a false church? No URC person would say that. It was as if some of the CanRC people felt that the ex-CRC people could only have been justified in leaving if they viewed the CRC as a false church. At least some in the URC would say that the CRC was no longer a true church, but they would not say that having women in office (and the other theological aberrations) resulted in the CRC being a false church. I think I can see why they said that. Certainly I don’t believe that a Reformed federation which adopts women in office can be said, by virtue of only that, to have become a false church. Let me explain. Let’s agree that article 29 of the Belgic Confession gives a faithful summary of the teaching of Scripture about the marks of the true and false church. Let’s use that as our starting point. What are the marks of a false church according to the Confession? It assigns more authority to itself and its ordinances than to the Word of God. It does not want to submit itself to the yoke of Christ. It does not administer the sacraments as Christ commanded in his Word, but adds to them and subtracts from them as it pleases. It bases itself more on men than on Jesus Christ. It persecutes those who live holy lives according to the Word of God and who rebuke the false church for its sins, greed, and idolatries. So, while the true church has three marks, the false church has five. Just as all three marks need to be in order for a church to be true, so it follows that all five marks need to be seen for a church to be false. In the original context of the 1561 Belgic Confession, there was only one church that fit the bill: the Roman Catholic Church. Does a church that adopts women in office become a false church? Certainly those first two marks are being exhibited, and perhaps the fourth too. However, not necessarily the third (notice the focus on adding and subtracting in the BC) or the fifth (the persecution envisioned leads to martyrdom). A church adopting women in office would have to go off the rails in all these other areas for it to be a false church. It practices the pure preaching of the gospel. It maintains the pure administration of the sacraments as Christ instituted them. It exercises church discipline for correcting and punishing sins. Does adopting women in office compromise any of these marks? “The pure preaching of the gospel” could be understood to refer narrowly to the proclamation of the good news of Jesus Christ. However, sometimes the word “gospel” is used more broadly to refer to the Word of God in general. I believe the latter, broader way is found here in BC 29. I say that because the French (or Gallican) Confession, upon which the Belgic is largely modelled, does not say “gospel” in its articles 27 and 28, but “the Word of God.” Therefore, if a church is not proclaiming the Word of God purely about who can serve in the offices of the church, this mark has been compromised. 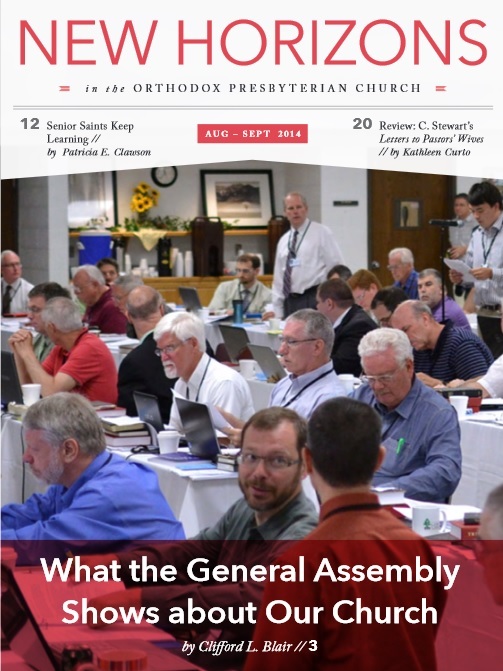 What about “the pure administration of the sacraments”? Did Christ institute the Lord’s Supper and Baptism with the intent that women would administer them? Does administering the sacraments to those who follow false teachings like women in office constitute a pure administration? We have to conclude that this mark too is imperiled by women in office. Church discipline is also essential for a church to be true. When members hold to false teachings like women in office, they need to be admonished and warned that they are departing from the Scriptures. When local congregations hold to women in office and begin implementing it, then there needs to be brotherly admonition on the ecclesiastical level — and action too, if no change takes place. But if a Synod decides that black is white and women can be ordained, then all possibility for discipline on this point disappears. So, yes, here as well we have to conclude that the church which adopts women in office has ceased being a true church. All three marks of a true church are affected by women in office. The church which adopts this position ceases to be a true church of Jesus Christ. This is why the Canadian (CanRC) and Australian (FRCA) churches will no longer be able to have ecclesiastical fellowship with the Reformed Churches in the Netherlands if they go in this direction. That still leaves the question hanging: if not a false church, and if not a true church, then what? It’s often forgotten that there is a third category in article 29 of the Belgic Confession: the sect. The sect is a religious organization which is not entirely a true church, but not entirely a false church either. In the days the Confession was written, this was the label applied to the Anabaptist groups in the Netherlands. Guido de Brès wrote a volume of over 900 pages on the Anabaptists. He never calls their groups “false churches.” Instead, consistently, he calls them sects. If you want a category for the church which adopts women in office, “sect” is what you’re looking for. As mentioned above, I pray that the Reformed Churches in the Netherlands rejects women in office once and for all. I pray that the faithful members will gain the upper hand and steer the RCN back to God’s Word. I pray that the churches which are already practicing this false teaching will either repent or be removed from the RCN. I don’t want to see them become a sect. I earnestly desire that we can continue to recognize them as a true church of Jesus Christ, our sister churches. We must keep praying! 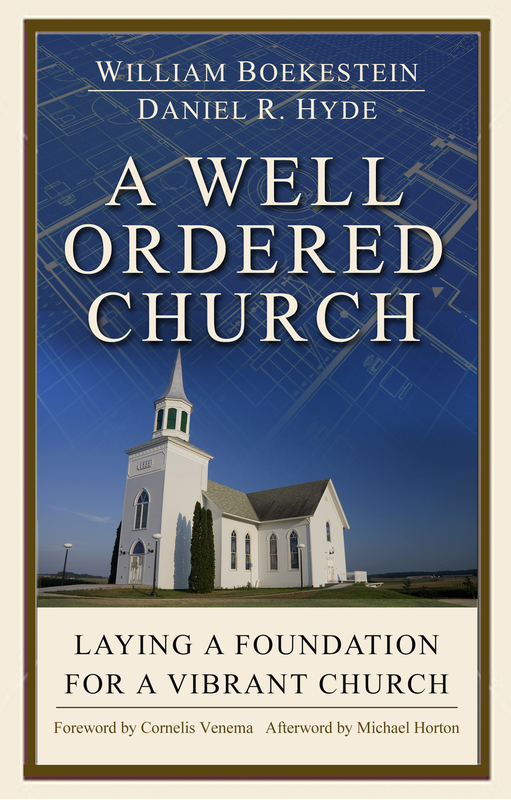 A Well-Ordered Church: Laying a Solid Foundation for a Vibrant Church, William Boekestein and Daniel R. Hyde, Holywell, England: Evangelical Press, 2015. There is always a need for books dealing with the doctrine of the church. Not only do those who’ve grown up in a Reformed church need new and timely treatments of this subject, but also those who are just coming on board to the Reformed faith. Both the newly-planted and the long-rooted need to have a solid biblical guide to what it means to be a church of Jesus Christ. This book fills that niche. The authors are experienced pastors and writers. Rev. Daniel Hyde has been the pastor of Oceanside URC in California for several years. Rev. William Boekestein has been the pastor of Covenant Reformed Church (URCNA) in Carbondale, PA for some years, but has recently accepted a call to Immanuel Fellowship Church in Kalamazoo, MI. Both authors have extensive background in working with people new to the Reformed faith. Both have written several well-received books. The book looks at the church under four main headings. In Part 1, “Identity,” the authors explain who and what the church is, especially in relation to Jesus Christ. In Part 2, “Authority,” the notion of office is explained and applied. Do the office bearers in Christ’s church bear any authority at all and, if so, are there any limits to their authority? Part 3 discusses “Ecumenicity” and the connections between churches. The final part deals with “Activity.” Here Boekestein and Hyde deal with the various callings of the church: teaching, worshipping, witnessing, and discipline. Generally speaking, readers will find faithful Reformed thoughts throughout this volume. The authors respect and work with our Reformed confessional tradition, give due attention to church history and, most importantly of all, they want to tie everything to Scripture. I can certainly recommend this book, but with two caveats or concerns. Chapter 5 has a discussion about the perennial issue of true and false church. The authors seem to argue that the Belgic Confession only knows those two categories. However, there is a third category in the Confession that’s often neglected: the sect. When Guido de Brès wrote his massive book on the Anabaptists, he consistently called them sects. He fully recognized the great diversity among the Anabaptists (he identified over a dozen groups), but he does not ever refer to any of them as being church, either true or false. Were he alive today, de Brès would likely refer to many of the groups around us with the same terminology: sects. Perhaps this language is offensive to modern sensibilities, but it is the language of our Confession. In Chapter 9, the authors use the expression “God is the missionary” a couple of times. There’s a kernel of truth in that insofar as God is the one who seeks out that which is lost. However, it is an expression that has been liable to misunderstanding and abuse. All of God’s purposes in this world for anything and everything can become “mission.” When everything is mission, then nothing is mission. Therefore, I would suggest that it is better and more accurate to say that God is the author of mission. Mission originates with God and it is his plan and design for the church to go into the world with the gospel of salvation. Notwithstanding those concerns, A Well-Ordered Church drives home two essential points: First, the church is not optional. Christians united to Christ must be united to Christ’s body. Those who love Christ must love his bride too. Second, because she is the body of Christ, Christ must be honoured as her head and Lord. He must be the one who, through his Word, directs and governs her in all his ways. These two points must never be forgotten and this book serves as a helpful reminder for this generation. Hiding the denominational name or identity, watering down difficult teachings, and lowering membership requirements do not appeal to new converts. The biggest factors that attract new converts are the pastor and his preaching (90%) and sound, clear doctrine (88%). Other lesser, though important, factors include friendliness, having been witnessed to, and personal relationships. Worship style ranked dead last as a factor (11%). Church members should be able to list the core purposes of the church: worship, teaching, prayer, evangelism, and service (consider Acts 2:42-47). Pastors of effective evangelistic churches have a functioning theology of ‘lostness’ and communicate that through passionate preaching, pleading with the lost, and commitment to personal evangelism. Pastor Van Dyke finished his presentation with a challenge that could be summarized like this: Major on the majors (concerning what the Bible teaches). Be biblical, have conviction, and be joyful. Give priority and passion to outreach. Develop effective small-group ministry and Sunday school that encourages teaching, growth, and fellowship. Pursue unchurched family members and colleagues. Uphold high expectations for members. Never forget the power of God! Rainer’s book certainly sounds worthwhile. His conclusions go against the grain of what many people apparently think should be the shape of an outward-looking church. To me this confirms that Reformed churches do not have to hide their identity or adapt their worship in order to be missional.